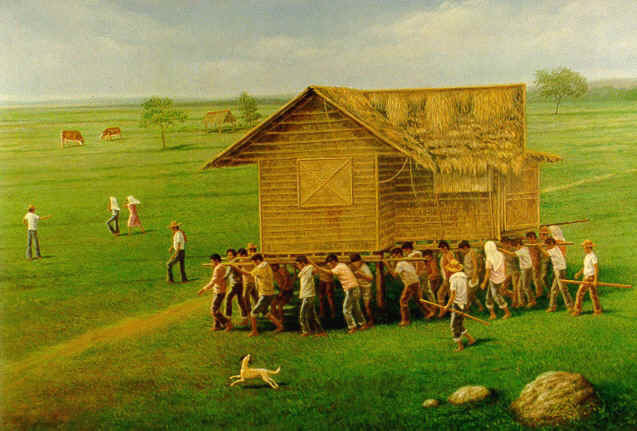 "Bayanihan" by painter Joselito Barcelona. Photo from hundun.wordpress.com. Margaret Mead reminds cynics: Never doubt that a small group of thoughtful, committed citizens can change the world. Indeed, it is the only thing that ever has. An unknown author meanwhile offers this advice: If you want to be incrementally better: Be competitive. If you want to be exponentially better: Be cooperative. Inspired by these words and for so many other reasons, I’m joining other Filipino bloggers to form a national organization. If you believe in the power of community and cooperation, join us in this bayanihan of bloggers. I have signed up a week ago. But that one is for professional blogger. Are you inviting us for National Bloggers Association (which means an association of bloggers in the Philippines) or to the Professional Blogger Association (which accepts only those who earn money through blogging)? i am a first time blogger and i like your ideas and your advocacy for Fi;ipino bloggers. keep it up! I’m new in writing blogs. I was inspired to write blogs after discovering more filipino bloggers are earning in this field. I love to write that’s why I want to try if I’ll be successful in this blogging stuffs. Anyways, it is good if we filipino bloggers could help each other in this industry.